Stadio Luigi Ferraris got built in 1910 after Genoa socio Musso Piantelli came up with the idea to use the ground inside a racecourse for a football pitch. His proposal got accepted and the new stadium opened on the 22nd of January 1911. The stadium originally only consisted of one wooden stand, but it quickly got expanded in the 1920s and 1930s to a capacity of about 30,000 places. In 1933, the stadium got renamed to Stadio Luigi Ferraris, in honour of the former captain of Genoa who had died in the first World War. One year later, the stadium hosted the round of 16 match between Spain and Brazil (3-1) at the 1934 World Cup. 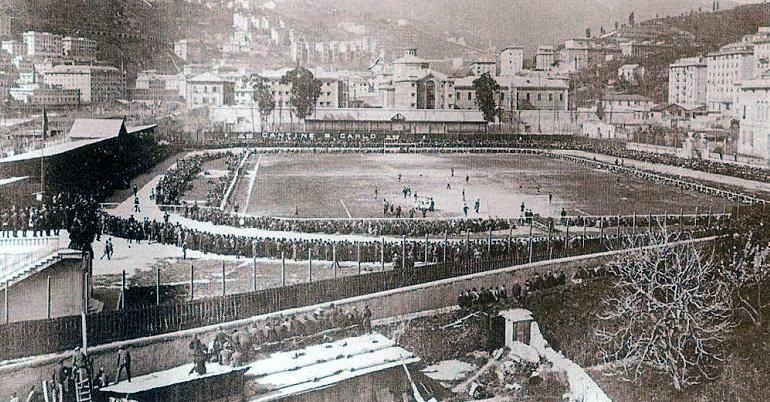 Stadio Luigi Ferraris was until 1946 the sole home of Genoa, but when Sampdoria git founded in that year, it requested to share the ground, which was accepted by Genoa. In the following decades, the stadium got gradually expanded to a maximum capacity of about 55,700 places in the 1980s. Stadio Luigi Ferraris was almost completely rebuilt for the 1990 World Cup. Construction of the characteristic new stadium, designed by architect Vittoria Gregotti, started in 1987 and was completed in 1989. Works were performed gradually as to allow Genoa and Sampdoria to keep playing at the stadium. During the World Cup, three group matches and the round of 16 match between the Republic of Ireland and Romania (0-0) were played at the stadium. In the last decade, only minor renovations have been performed on the stadium, and its state has slowly deteriorated. 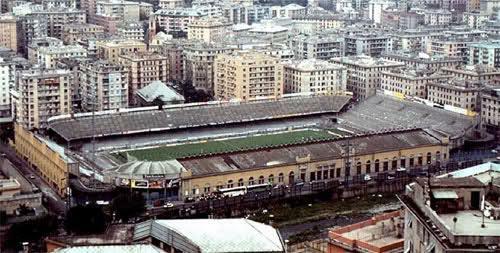 Over the years, Genoa and Sampdoria have therefore looked into either redeveloping Stadio Luigi Ferraris, or into building a complete new stadium. Currently, however, no concrete plans exist. Stadio Luigi Ferraris is located toward the north of the city of Genoa in the Marassi area. It lies along the Bisagno river(bed). The stadium lies only 1.5 kilometres from Genoa’s historic city centre, but is best approached in a little roundabout way from the south (to avoid climbing up and down the hill that lies between the centre and the stadium. 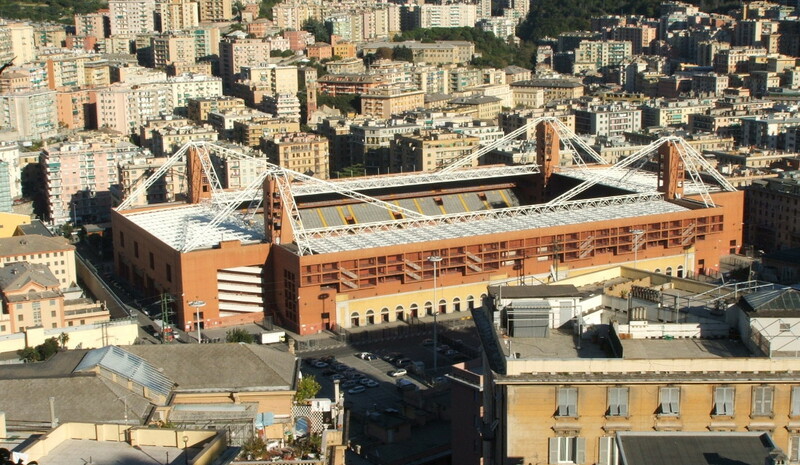 The stadium is at walking distance from Genova Brignole train station, which is mainly served by regional trains. Follow the Bisagno river inland for about a kilometre. Brignole train station is on the western edge of Genoa’s city centre. From Brignole you can also take bus 480 or 482 in the direction of S. Eusebio. It is just a 7-minute ride to stop Marassi/Stadio. Genova Principe train station, where the long-distance trains arrive, lies further away, about 3.5 kilometres from the stadium. You can take a train to Brignole from Principe station. Alternatively you can catch bus 12 or 13 from metro station San Giorgio. Take the bus in the direction of Prato, and get off at stop Bobbio5/Stadio. From metro De Ferrari you can take bus 14, also in the direction of Prato. On matchdays, special bus services run from Caricamento (CM), Piazzale Kennedy (KM and 47), and Principe train station (SM). If arriving by car, take exit Genova Est from the A12. Follow directions to the city, and later on the signs to the stadium. Stadio Luigi Ferraris is located in a dense urban area, which means that there is no shortage of the typical Italian bars and restaurants you find in such neighbourhood. There are furthermore plenty of options for eating and drinking in the area around Brignole train station. Genoa’s principal nightlife areas are a little further west in the southern part of Genoa’s historic centre. There are no hotels in the immediate surroundings of the stadium, but a good few in the area around Brignole, which gives you convenient access to the stadium and city centre. Hotel Nologo, Hotel Brignole, and Hotel Ricci are some of the more budget options, while Starhotels President and Golden Tulip Hotel Moderno Verdi are for those that have a little more to spare. Click here for all hotels near Stadio Luigi Ferraris and Brignole train station, or here to see further options in Genoa’s historic centre. Tickets for Genoa matches can be bought online via Listicket (print-at-home tickets), or in person at the Genoa Store at the Palazzina San Giobatta in Genoa’s city centre near San Giorgio metro station. Ticket prices typically range from €15.00 for the ends to between €30.00 and €50.00 for the long sides, but can be higher for high-profile matches. Tickets can also be bought at the stadium from 5 hours before the match. Make sure to bring a passport or ID-card. Genoa only occasionally sell out. Email ticketoffice@genoacfc.it for more information. Tickets for Sampdoria matches can be purchased online via Listicket (print-at-home), or in person at the Sampdoria points at the Via Cesarea 107-109 (city centre) or Via Biancheri 25 (western Genova). Tickets for the ends cost €15.00, whereas those for the long sides cost €60.00. Prices are increased with €5.00 if bought on the day of the match (except behind the goal tickets). Email biglietteria@sampdoria.it for more information. Genoacfc.it – Official website of Genoa CFC. Sampdoria.it – Official website of UC Sampdoria. Genova-turismo.it – Genoa tourist information. AMT.Genova.it – Genoa public transport information. Trenitalia.com – Check train times and fares. Thank you for the advice. The stadium is a 20 minute walk from the Brignole metro/ train station. Attended the Genoa vs Frosinone game and bought tickets for Distinti- along the side- for €30 from ticket booth across the street from the Curva Nord. Passport required and speak loudly as you can’t see who’s in the booth selling you the tickets! A great family atmosphere in that stand and super atmosphere generally around the ground. – Buying tickets through Listicket was not possible as they required a club membership number. – Buying a ticket at the Sampdoria Point at the Via Cesarea went well. It was open on the day of the match. – There is no ticket sale at the stadium on the day of the match. – The stadium can easily be walked to from Brignole train station. There is a good number of eating and drinking options near Brignole. – A ticket for the upper tier of one of the ends cost about €30.00.